What We Do｜Mitsui Chemicals Tocello, Inc.
We do everything from R&D to production and sales. That means sowing the seeds of innovation and harvesting new technologies ahead of the competition as we move quickly to deliver just the right products for you. Let us help you boost production efficiency, enhance product performance and quality, as well as make your commercial products and services more appealing. Having every piece of product development and basic research data along with the right know-how at its finger tips gives our R&D team the tools they need to deliver product-oriented solutions. R&D works hand in hand with sales to get to the bottom of what our customers really need while being a member of the Mitsui Chemicals Group with access to its latest technologies gives us a leg up over everyone else. Our factories work side by side with our R&D department to ensure quality every step of the way throughout the entire manufacturing process. The wealth of technical expertise we've gained over the years is the secret behind our constant supply of high quality products. 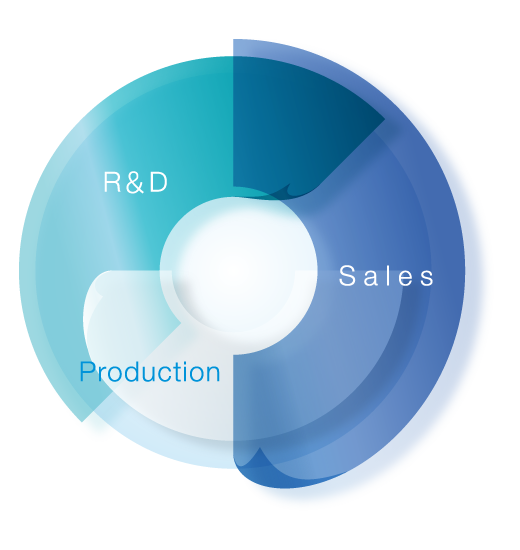 The sales department tells R&D and production exactly what the customer requires. They then go to work, harnessing their knowledge of the product development process and state-of-the-art technologies to bring those requirements to life with a custom-made solution. Mitsui Chemicals Tohcello offers a wide array of product lines and tailor-made solutions designed to meet a world of industrial needs. We have forged a fully-integrated manufacturing system, encompassing everything from materials development to film and sheet processing, that harnesses the dynamic synergy of the entire Mitsui Chemicals Group and can serve customers around the globe. We will continue to create innovations that combine materials science with processing technology as we work with an eye to delivering products that add value to our customers' bottom lines.